Feel the floor with TAP shoes, JAZZ shoes and so much more! CABARET Leather chorus shoe. Cushioned insole for comfort and shock absorption. Elastic j.. KICK LINE Synthetic upper with canvas trim. Flexible resin sole. ..
BROADWAY LO character shoe in soft durable synthatic upper. The subtle curve design at the to..
TAP-FLEX Lace up split sole full grain leather and leather stacked heel ..
SPLITFLEX A versatile leather character shoe ..
SPLIT FLEX II A versatile leather character shoe with an ankle strap for a sophisticated ele..
ΔΕΡΜΑΤΙΝΑ ΠΑΠΟΥΤΣΙΑ ΓΙΑ ΠΑΡΑΔΟΣΙΑΚΟΥΣ ΧΟΡΟΥΣ ..
CUBAN BUCKLE TAP Full grain leather upper Cushioned sock lining Buckle strap TeleTone® t..
Oxford style tap shoe for the more professional tapper. Soft man made leather upper for pure comfort.. 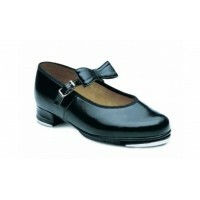 The Leo Jazz Tap Shoe features the jazz tap look at a fraction of the price designed for the young a.. CHORUS Supple leatherette upper provides soft, flexible comfort. Padded insole and supple lining ..